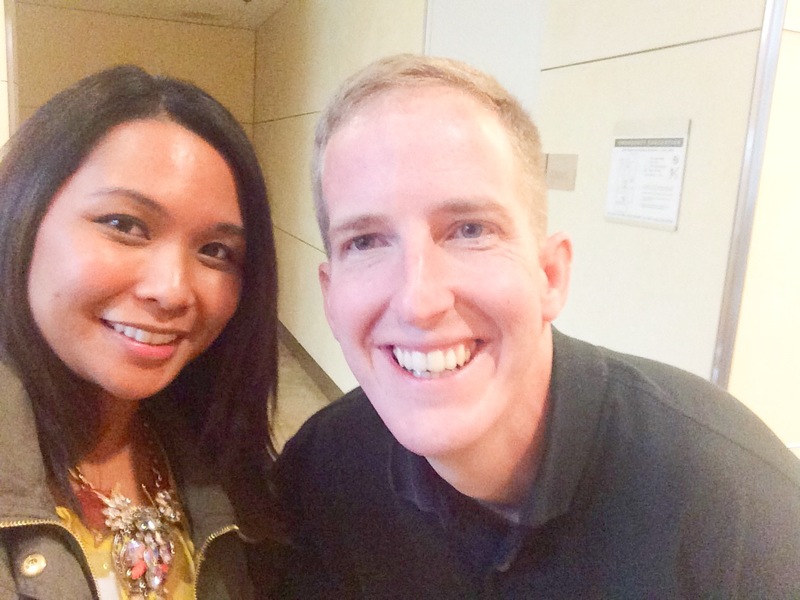 On Wednesday of last week I visited Electronic Arts (EA) Redwood Shores in California for a preview of Star Wars: The Old Republic, Shadow of Revan expansion! If you are reading this then it is past the embargo time/date, and I’m so excited to talk about my experience and the information that we learned. I am glad that I prepared beforehand for this event by backing up my phone (for at least 12 hours?! ), making sure there was enough room for pictures, notes, and recordings, because this was a very crucial opportunity. 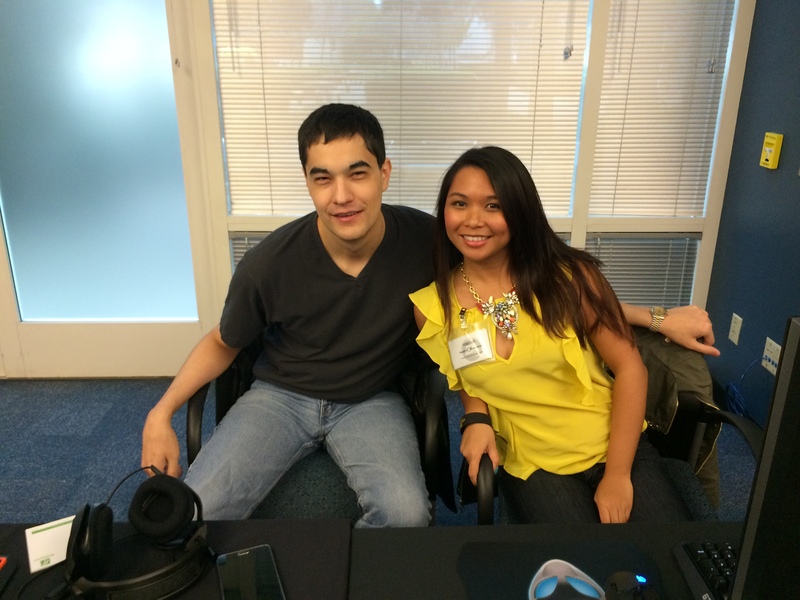 Click to read more about my experience, and the transcript for our Q&A session with the devs! 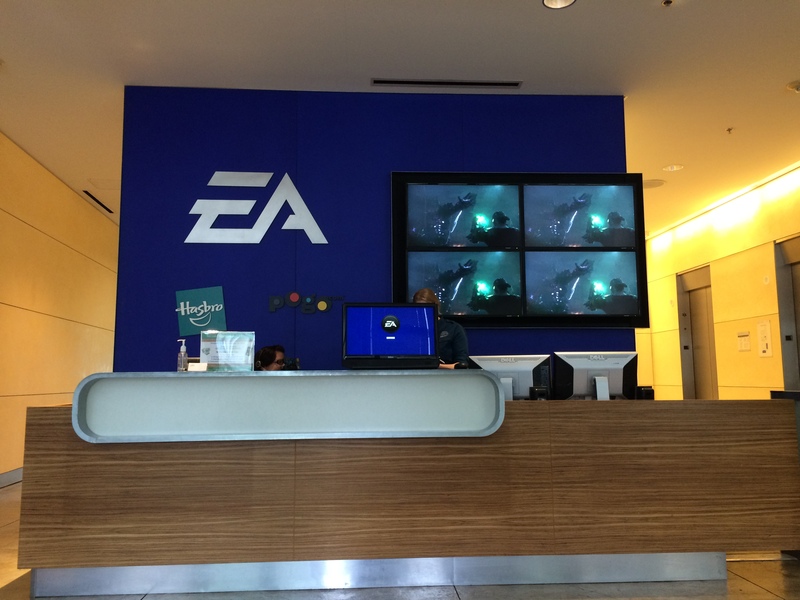 I arrived at EA about an hour early! I actually left two hours early because I was worried about traffic, but I was the first to arrive. 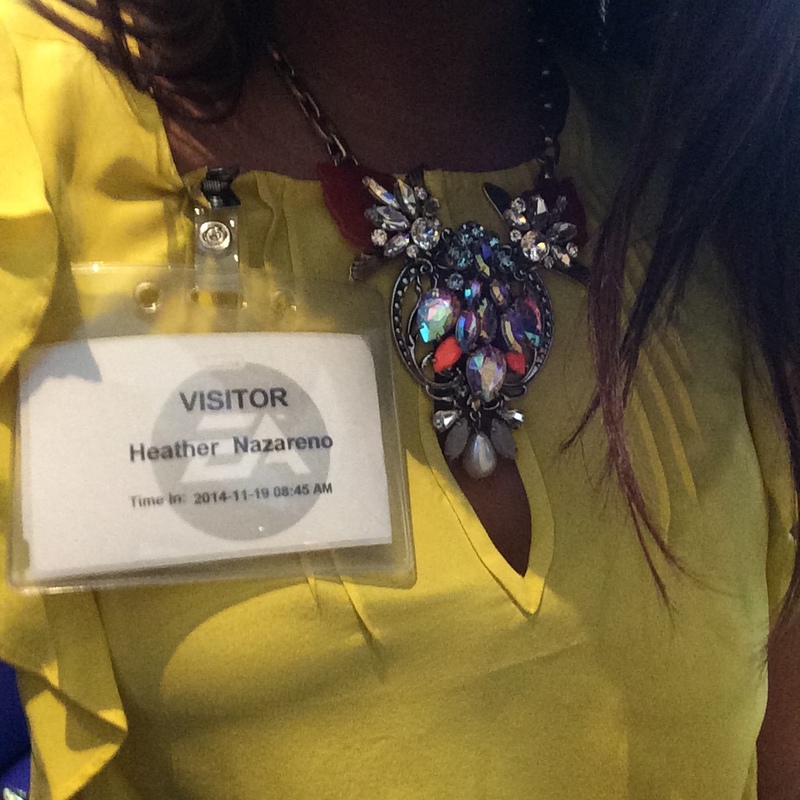 I checked in and received an awesome visitor’s badge! In the lobby there was an area where you could demo some Xbox games, so I tried Thief for about five minutes. I am clearly not a console gamer, and I didn’t have patience to see where I was supposed to be shooting the rope. The game did look cool, but I didn’t want to spend a lot of effort getting into it, as I wanted to be alert if anyone important from EA was walking by! A few more people arrived, and Lawrence Lacsamana from fortyseven communications and Melissa Ojeda (EA Public Relations Manager) came around to make sure he had everyone’s SWTOR account name and e-mail. 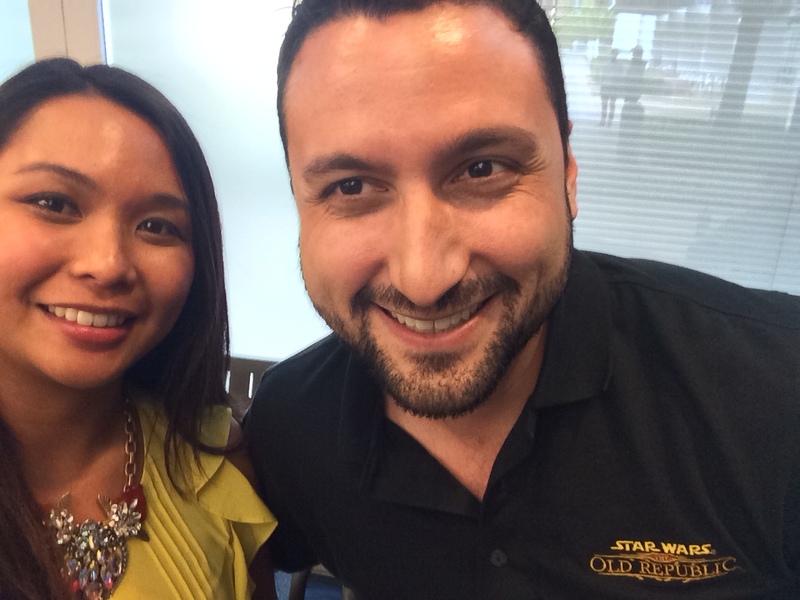 This is when I met Victoria AKA Swtorista, and I was so excited! I wish we had known the other one was attending because we were in the same hotel, but I’m really glad she was there since I’ve heard so much about her. 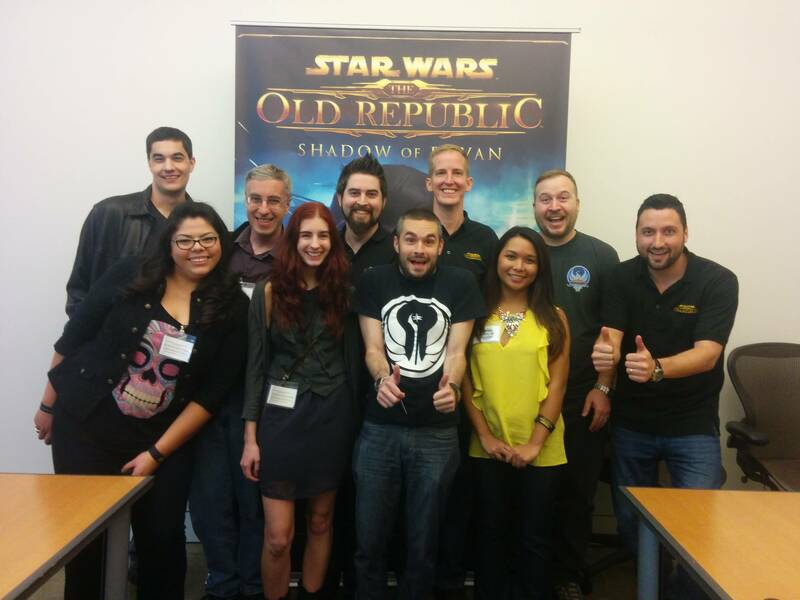 We hadn’t communicated much before then since we have different channels of communication to the SWTOR community. I also met Michael, the guild master from the Death and Taxes guild, who I was supposed to hang out with the night before. Thank you Justin (@warlordkephess) for letting me know that he was going to be there! Unfortunately his hotel was a bit further from downtown San Francisco than mine, so he didn’t go out the night before when I did. 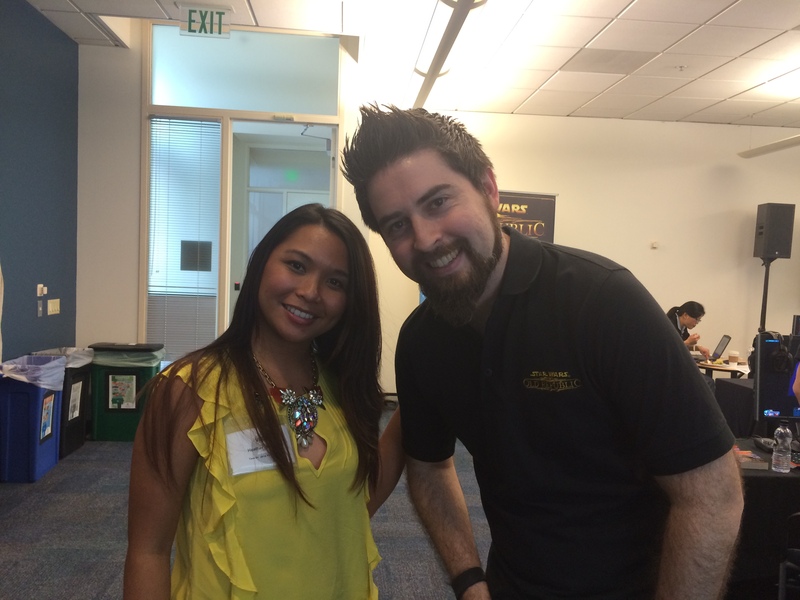 The final person from the community at the event was Aracely AKA Lulaboo, a streamer who is also the girlfriend of the well-known streamer Towelliee. 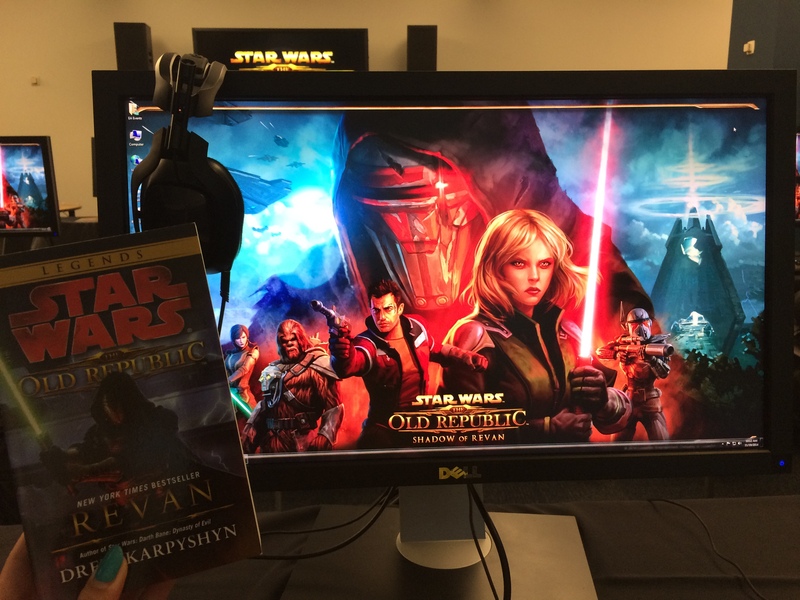 They brought us into a room with about 16 computers, all showing the Shadow of Revan image as a wallpaper on the desktop. Lulaboo, Swtorista, Michael, and I had special seats in the back row, since we were actual players and fansites and not just press attendees. 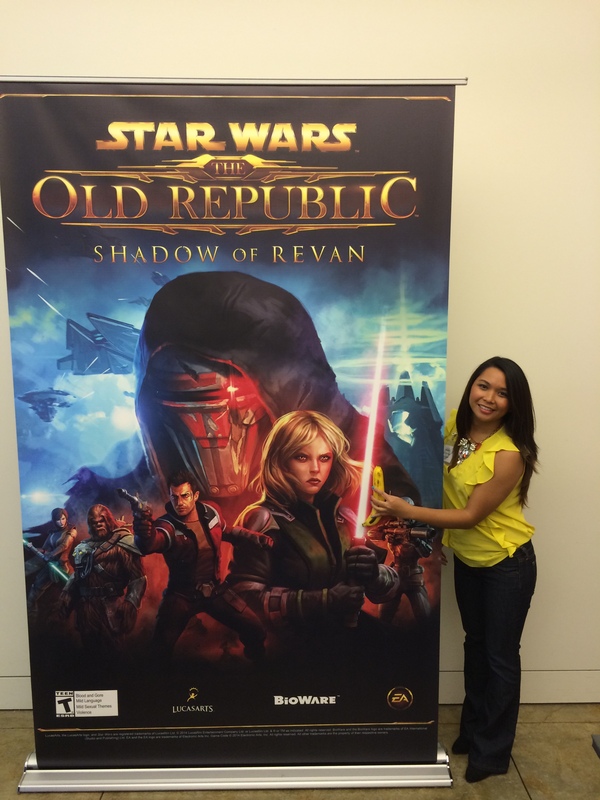 There was another large Shadow of Revan poster, and some snacks and drinks set up on the left side of the room. On the tables were also copies of the novel Revan and Shadow of Revan wristbands, like the ones I received from the Las Vegas Community Cantina. The presentation started with Debysue Wolfcale, Marketing Director, who went over the day’s agenda. She was very excited, after the presentation, to talk about how she played a Sith Assassin. It seems she’s currently playing a hybrid-spec, but for 3.0 she will have to focus on one discipline! I was happy to tell her that I really enjoyed playing Deception on my Assassin. 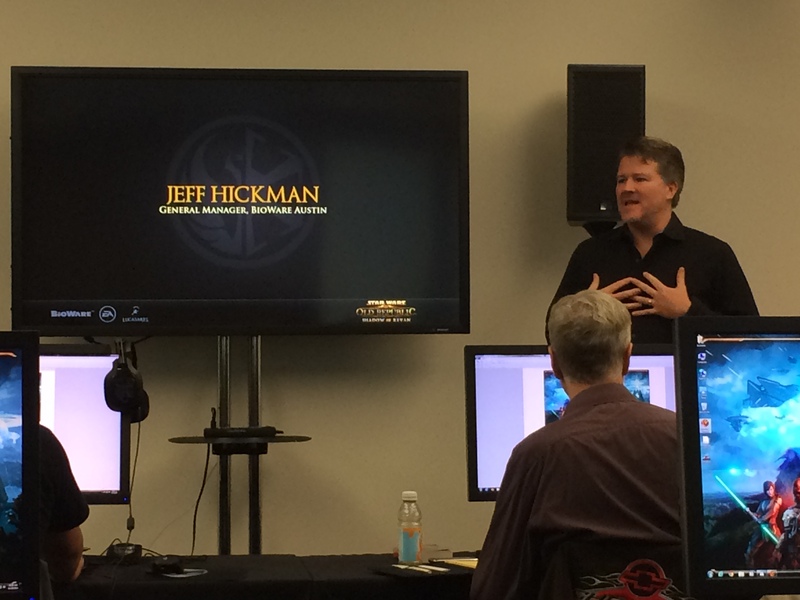 The first presenter was Jeff Hickman, General Manager at BioWare Austin. He talked about the game thriving with over one million players a month with 3 AAA quality expansions so far and the 3 year anniversary of the game coming up soon. Additionally, he said that next year will be a big year for Star Wars overall with the Episode VII coming out December 2015, and that they will be introducing new, bigger, and cooler things to the game! The next presenter was Bruce Mclean, Senior Producer. He reviewed the features of Shadow of Revan, such as the increased level cap, new flashpoints and two new planets, Rishi and Yavin 4. He also mentioned a new solo-mode for flashpoints, in which you can clear the flashpoints with NPCs helping you. The Forged Alliance flashpoints will also be getting solo-modes that will drop powerful gear that will help people get ready for the content in the expansion. The Ravaged operation ends on a ship flying on a cloud, which looks incredibly cool! Revan is a final boss, and he’s the toughest one yet. Charles Boyd, Lead Writer, was up next and he talked about his writing team planning stories for Revan since 2006! He was happy to finally be able to present this chapter in The Old Republic lore, and this is definitively the last chapter (that they’ve written for now, haha) about Revan! We were then introduced to other members of the BioWare staff that was present: Andrew Horowitz (Producer), Eric Musco (Community Manager), Deb Shin (Marketing Manager), Hazel Kelly AKA HK-30 (Live Producer), and Erik Mulkey (QA). If you read my post about the Las Vegas Community Cantina, I had previously met Andrew, and I have also met Eric Musco quite a few times before. We did some hands-on gameplay of the expansion after that! 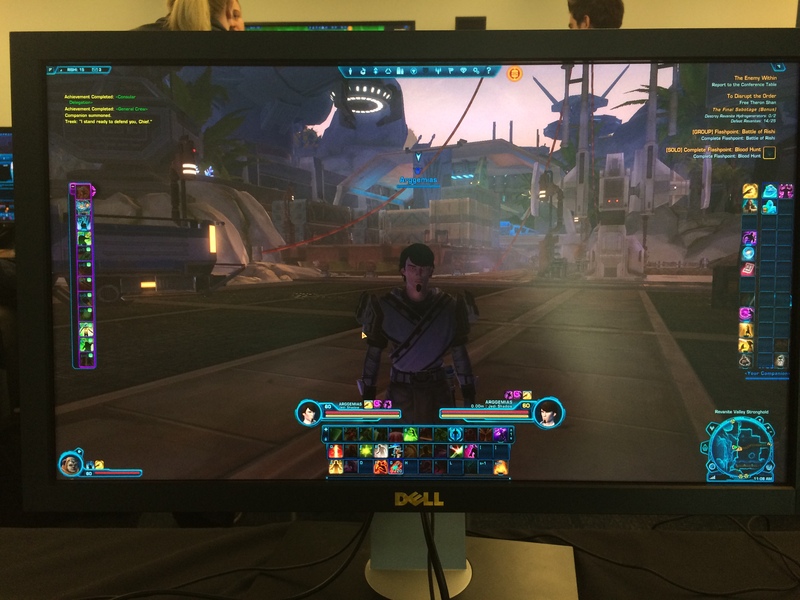 We had a choice of 4 different characters, and each computer had a different variety of Republic advanced classes. 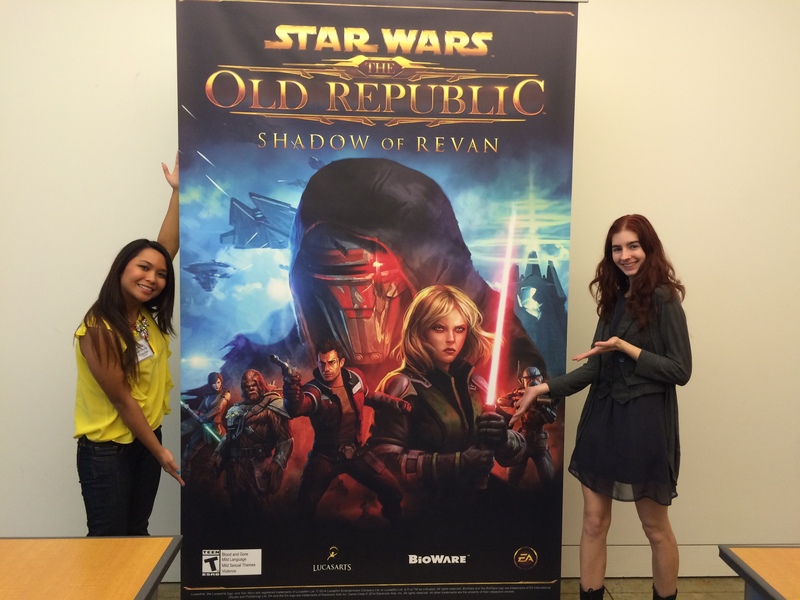 (I asked why Republic, and the BioWare staff said because they were Imperial-biased, haha.) I traded computers with Michael once we figured out that my computer had a Jedi Guardian and his computer had a Jedi Shadow (character name Arrgemias, chosen beforehand by the BioWare staff using SWTOR’s “Random Name” button), because obviously I wanted to play the Shadow and he wanted to play the Guardian. As the staff was telling the rest of the non-players in the room about disciplines and utilities, I chose mine: Infiltration discipline with some PvE utilities. We also took some time to set up our UI and hotkeys, which didn’t take too long for me to do. They had everyone do a couple PvE missions, including one involving Theron Shan, and also completing the flashpoint Bloodhunt in solo-mode. It was quite easy for me to do both in 192-rating, set bonus gear. The “Jesus droid” that helps you in the solo-mode flashpoint made it super easy. They did recommend using HK-51 also, who I think had better gear on him. Obviously I was stubborn and wanted to use a tanking companion, so I brought Treek (probably with lower level gear) out, who died anyway. In Bloodhunt, we do see Shae Visla at the end of the flashpoint! I really need to get caught up on my lore, because I think these stories would mean more to me. Perhaps I should finish OotiniCast’s spoilercast episode! As we finished the flashpoint, our reward was lunch! We were served some BBQ chicken, pulled pork, macaroni & cheese, steamed vegetables, and cornbread. There were also cookies as a dessert! The water bottles were also branded with EA, which I thought was super neat! I haven’t thrown away the bottle at all! I got too much food, as you can see from the picture, and the crumbs from the macaroni & cheese were getting all over my black tablecloth and the keyboard. Oops! 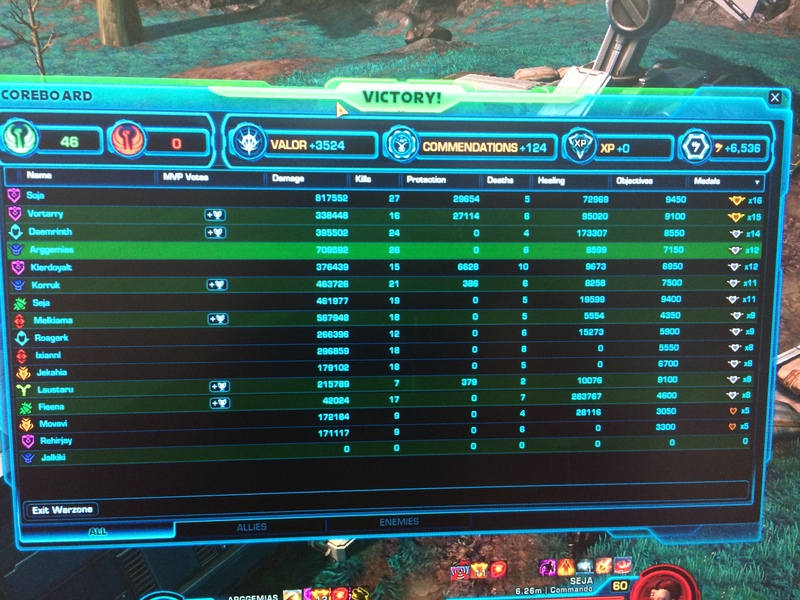 After lunch we did a round of 8v8 unranked PvP! I switched my utilities to ones that were more useful in PvP. We were supposed to do The Ancient Hypergate, but we ended up in Novare Coast instead. 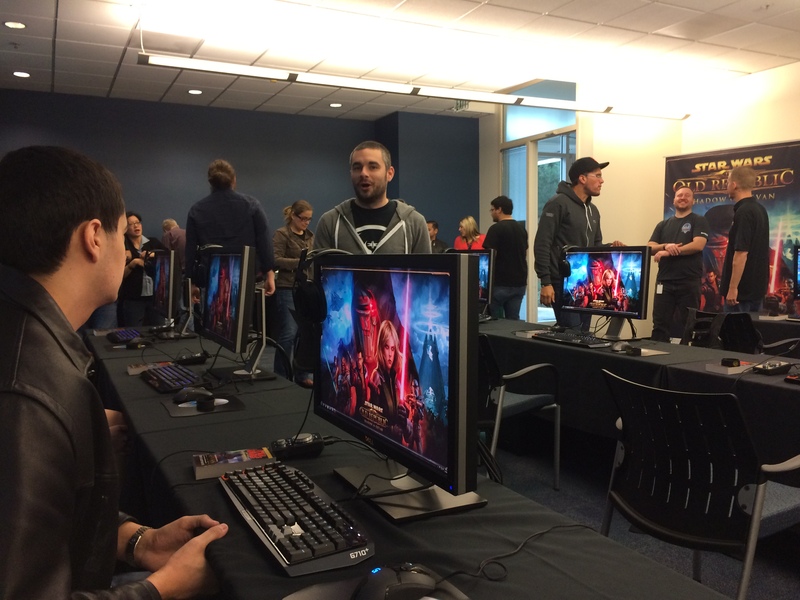 A few of the Bioware employees got onto computers so we would have enough players for two teams. The group makeup was random, so we weren’t sure which team the actual players would be on versus the press. 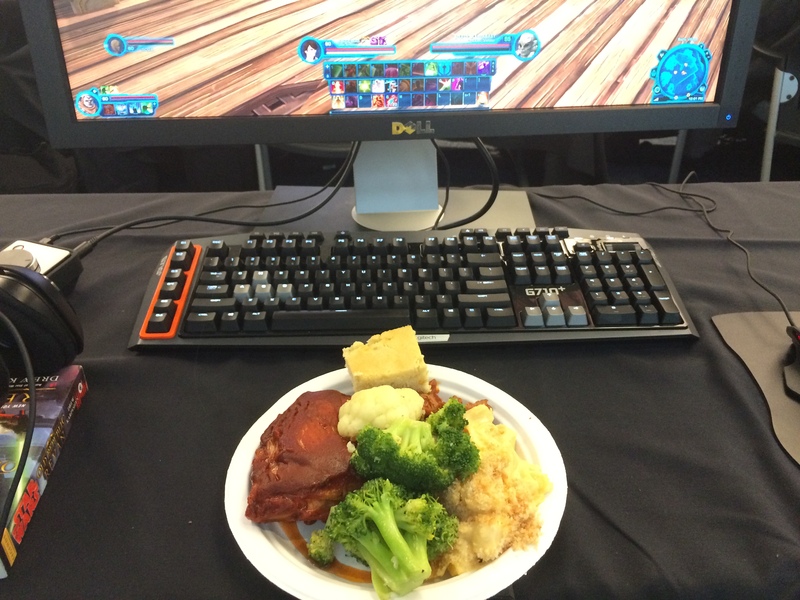 We were also playing on a closed, dev server created specifically for the event. My team ended up having only seven, since Eric Musco’s warzone didn’t load or something, but we still won, which was nice! I had the most kills (28), but Michael from Death and Taxes was close behind with 27. He still ended up with a bit more damage output and medals than me though. I enjoyed playing the Infiltration (Deception) discipline in 3.0. I don’t remember ever using my basic attack, which means force sustainability has increased. Additionally, I used Whirling Blow (Lacerate), and I didn’t feel like it sucked up all my force. I also think they increased damage for it, but it could be because I was in better gear than what I have on right now. I actually don’t like Whirling Blow (Lacerate), but it’s the only AOE ability, aside from Force Wave/Overload, that Inflitration/Deception has. And Overload can be a pretty annoying knockback for other players, so I don’t use it that often when I do group content. After the warzone, we had some time to do whatever we wanted in game and interact with some of the BioWare staff before our personal Q&A session with the devs, and then the time finally came! They took us to a different room, the one that had the original Shadow of Revan poster that Swtorista and I took a picture in. We started up our recorders, and the Q&A began. Thankfully my recording survived and will be published on the latest episode of Corellian Run Radio that should be out today! I HIGHLY, HIGHLY recommend listening to the audio version of this Q&A, because many answers are summarized here in the transcript, and you can hear tone and more detailed information in the audio version. I have my own commentary that I wanted to post on here, and I also wanted to thank everyone that gave me a question they wanted to ask! I tried to ask questions that would produce the most answers and information from the devs. Additionally, I would like to emphasize that this Q&A is paraphrased and not direct quotes. To hear exactly how these questions were asked and answered, please listen to the latest episode of Corellian Run Radio about the event, which will be released today and linked here when it is. 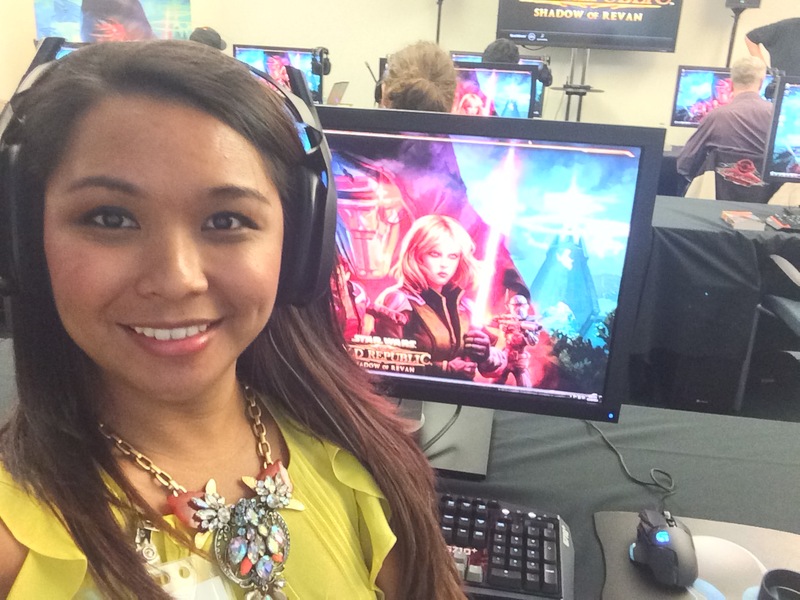 Thank you so much to Swtorista for taking the time to transcribe the interview! Please visit her post to read her thoughts about the event as well! Dev: Whatever you guys want to talk about, instead of the formal 101s we did with the other folks. What do you guys want to talk about? What burning questions haven’t we answered yet? 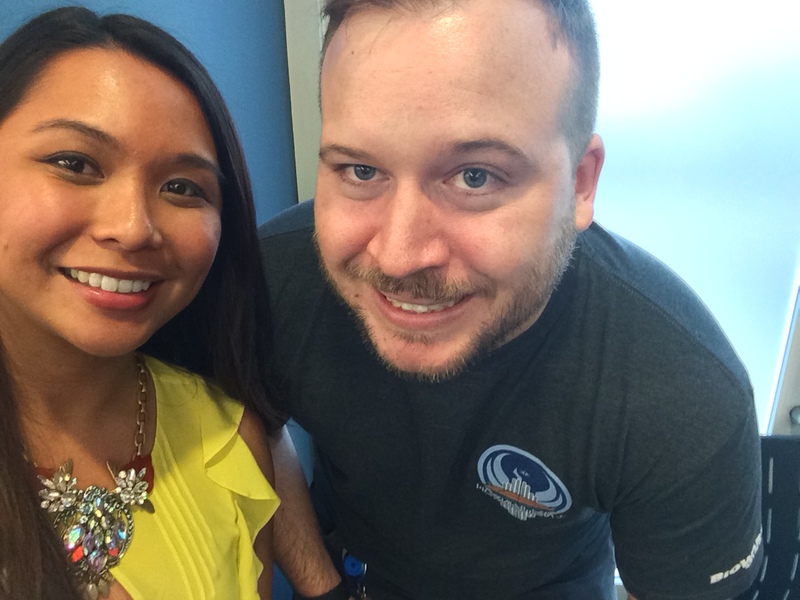 Heather: What’s going on with GSF? Dev: There’s nothing really going on right now. We are working on some stuff for it next year but we can’t talk about it yet. Dev: The reward scheme is definitely the target for us. Heather: I heard that privacy issues are the reason that global ignore is due to a privacy issue that is meant to protect the harasser? Michael: I don’t want someone to friend me on one character and be able to talk to me on another. Heather: Can we make ignore happen, but friends not? Dev: Anything you talk about account-wide anything, it’s always been a privacy issue. We had that one time where you whispered one character and it would go to another of their person’s – that was a huge privacy issue. Swtorista: Related, one of the suggestions I have seen is an “ignore and report” button without a popup that disrupts gameplay. Devs: [general agreement] Some other games have that functionality and it is GREAT. Heather: The thing where the abilities light up, can we have that as an option? Heather: Can you now talk about the thing you were referring to that was better than cross server for queue pops? Dev: Still working on it. We are talking about what to talk about. Something was promised a couple weeks ago, but no promises other than that. We’ll try before the end of the year to announce something. At the very least we can give a date. To be clear, what you’re going to get is not “here’s what we’re gonna do”. What you’re gonna get is “we know there’s a problem, we know there is a concern from players about this” and we are actively working on a solution. We’re not trying to be coy – but we want to be able to explain it in full detail. It’s a highly technical issue. Swtorista: Are you aware the most commonly guessed solution is to allow F2P to queue? For everything? Ranked? Dev: We looked at those numbers, and it would be trivial. For example F2P players can do 5 warzones a week – the amount of players hitting that restriction are less than 2%, around 1.4% of players who have that restriction. And that’s from the pool of F2P players that play warzones at all. It would not even make a difference. We have better solutions – we’re working on it. Lulaboo: Will we see a resolution to Revan in this expansion? Will we see a resolution to his story, to his character? Michael: This has been the longest [operation] valley in the content cycle in the game’s history. Is this an anomaly? Dev: Yes. The reason why is we took a break effectively to build Galactic Starfighter and Strongholds. Heather: Is there going to be any other content-expansions before the next big expansion? Like Galactic Starfighter? Dev: It’s safe to say that there is a finite number of core Star Wars fantasies. Piloting for GSF, being on the flagship and conquering planets is another. Those are very much filling the need that we are asked about at Community Cantinas. Fulfilling a need that we felt and our community felt. Unless you think of something… nothing to that scope. We’re doubling down on our BioWare cinematic storytelling. Heather: What about minigames? Podracing? Gambling? Dev: We are aware of these ideas. We love them. Swtorista: It was mentioned on one of the podcasts that you couldn’t do podracing due to graphical issues because you’d see yourself as ahead of someone else. Dev: It’s not so much graphical issues, it’s how the servers work. On your screen, you won, server says no, sorry, they won. That’s not very fun. It’s just a natural client-server problem. There are tricky little ways you can get around it, LOTRO has the horse racing, where it’s just you doing a timed race, but that’s not really the spirit of podracing. Michael: Did you ever get collision to work out? Dev: That’s another thing. Our collision is not built for a moving physical race, two moving parts. You would just go right through each other, takes some of the excitement out. Turns out we didn’t build a racing game… so… yeah. Michael: In the movies there was no winner… everyone else just died. Lulaboo: Talking about next year… are you guys allowed to talk about what’s coming up after this expansion? Dev: Not yet. Only that we are doubling-down on BioWare cinematics. You’ll probably have a few hints when you get to the end of this one. MMOBOMB: When you’ve mentioned this before you’ve said you were working on it all the way back since 2006. Why now? Why Revan 3 years after launch? Dev: The story just kind of had to develop to that place. It’s partly with new releases, which characters do we need to get into the story, and it’s not really “right now”. We created this story a year ago, starting with the Forged Alliances flashpoints. We didn’t sit down in 2006 and write everything, lots has changed. Dev: Forged Alliances was really cool, but what I didn’t like is that it forced us into a spoiler-free silence. A very difficult year for us. We couldn’t talk about the next expansion ’til the last Forged Alliances flashpoint came out. Dev: It’s a funny year for us. We had Galactic Strongholds come out in August, then BOOM we announce Shadow of Revan, a big expansion. We would normally not do that, but Galactic Strongholds was important and we wanted to reorganize everything. Dev: Yeah, it’s been building up. If anything I feel like it’s been a long time since we touched on that particular thing. It’s not gonna get wrapped up in the next patch or anything. Charles is not going to write us out of business. Dev: Good question. Any time we add an authenticator to a phone we have to constantly keep it updated. There has to be a market. They cost us a lot of time and break with updates. I’ll talk to our platform guys. Heather: Are there new character customizations in the works like hair, eyes? For beyond 3.0? Dev: There are some in the works. Michael: I’m not saying pull it out – just for Nightmare gear. You already can’t craft it, ever. You still can’t craft Kell Dragon gear. Dev: It’s a valid point. Jesse wants to overhaul how the legacy gear system works in general. I’m pretty sure that’s the only thing people use it for. It’s not really serving its purpose right now. It’s something we are looking at to alter but we don’t know how yet. Michael: [Michael explains that token gear should never be badly optimized. He should never have to buy 14 pairs of boots to get optimized gear. It’s also a barrier to entry to the casual player who is poorly optimized and has no idea.] There’s a couple solutions – bosses could drop enhancements instead of full gear pieces, because the system’s already modular anyway. I don’t know if you want it to be that quick. Dev: Yeah. We’ve been talking about guild functionality. We love guild mail. There are technical limitations we have to overcome. Anything can be overcome with enough time and resources, but it’s a question of it being worth it. With conquests and flagships, it’s more worth it now than it has ever been. Dev: That’s something that is more commonly asked for. These tweaks.. overhauls… we realize it too. Now that we’ve “checked the box” with player housing, it won’t be asked for as much. Heather: The combat system has changed significantly with 3.0. Can all players expect to produce equal damage regardless of what class they choose? Dev: I would say we have been trying to, behind the scenes, invest time into our developer tools. When the game was first launched it was a massive undertaking, 500+ people working on it around launch, so we brute forced a lot of things. We don’t have ideal developer tools in some areas, and one of those areas is combat balance. I kid you not, and I hate to be recorded on this, but our measure of DPS a year ago is, we’d get the rotation we wanted to measure, we’d get a stopwatch, and we’d actually do damage against it. That’s what our developers did. Since then we’ve built automated testing tools that just do it. And measure the output. Our class designers are much more confident but are never perfect. If people are complaining about class balance, then that’s the only problem we got [laughter]. But we take it very seriously, and they have better tools now than they ever had before. That being said, we just raised the level cap, just released disciplines, there’s new abilities, so the target is “I want everyone to be within 5% assuming the perfect player”. Everyone should be within 5% of each other. That’s the goal. Whether we hit it or not, we’ll see. We’re ready to see how it plays out. Those guys, more than anybody else, have just been working their hearts out. Since we went to public test, they’ve been working every weekend, we didn’t say they needed to, they wanted to, every weekend work late nights, crawling the forums, and they think they got it. They set those +/- goals and last week they said “yep, we’re good”. Dev: It’s one of the unspoken things we had when we were doing the Class Rep system that I couldn’t tell people unfortunately, what I couldn’t tell them at the time, was that a lot of the suggestions that people didn’t think we were listening to literally was injected directly into the changes for 3.0. Things like “Sorcs don’t have a defensive cooldown” – now they have 2 if you pick the right abilities in 3.0. I couldn’t tell you that a year ago – yeah, they’re working on a class expansion, we couldn’t get those changes in a year ago we couldn’t say that a year ago we were working on an expansion. Dev: In Rise of the Hutt Cartel [last expansion] with the level cap going up and new abilities, we had to take the talent trees back to zero and rebuild them, and we’re faced with the prospect of having to do that – and that makes balancing difficult as well. One of the advantages to the disciplines system, including the player-facing advantages, you can’t mess up not having the right skills. We have data on what our players pick and it is surprising. You’d be surprised. Actually you wouldn’t. [laughter] It is much easier for our developers to work with balancing with the disciplines system. We know the core damage abilities that each person gets, there’s no magical spec, there’s no hybrids like scoundrels that can heal and make damage. Disciplines also helps them in their confidence in achieving better balance. Rob Hinkle: It depends on what we are doing. For pure DPS test runs (like against a dummy), we tend to wear the highest level gear available to the players, fully augmented, stimmed, and with all of the legacy/companion buffs. We do our best to select the same stats players tend to wear, but that process isn’t as rock solid as it should be. Michael: When the Devs are testing specs, what gear are they wearing? If it’s stock, then you’re not going to get accurate numbers. Dev: Absolutely. I can’t remember what they actually use. Whatever it is, it’s not what you want. Michael: Is that the reason we do too much damage? Dev: I can answer that. The way we measure DPS against bosses was scored incorrectly internally, it’s one of the reasons we are making the changes in 3.0. We were off by about 2%, that’s a HUGE deal. Heather: Legendary gear is a searchable option on the GTN and was mentioned at launch. Will we ever see legendary weapons and or armor? Dev: I don’t think we can say anything about that yet. But talk has been happening about things that are related to that. We haven’t forgotten about it. Heather: What’s the status on legacy banks? All your credits pooled together on all your characters. Or at least having legacy bank access in the cargo hold. Swtorista: GW2 added it and it works out really, really well. Dev: I imagine something like that would potentially get rolled out if we alter collections. Heather: Is there any chance of getting a Legacy family tree decoration? You can see the portraits in the tree. Dev: We love that idea. Corey knows about that idea, we’ve been talking about ways to make that happen plus other cooler stuff that that would allow to happen without saying too much. Heather: I know a lot of achievement people would like more decorations for achievements. Dev: We are going to continue to add decorations to the game for sure and across all content. Heather: Since we have so many new daily areas, can we have an expanded mission log? Even 30 would be nice. Dev: That’s tough. We’ve talked about that before. No one is against it philosophically – it’ll come up every once in a while and we’ll ask “Why do we have this cap?” and we’ll go to the engineering team and be like “oh right”. Dev: In combination with strongholds, we have a love-hate relationship with our engine, and in some ways it’s a bear. Heather: Any plans on updating the engine? Dev: [resounding No] It’s what we got. Michael: May I offer some criticism on conquests. It’s impossible to motivate my guild [Heather interrupts and informs everyone that she’s in Despair and has been at #1 for two months, laughter] – we have roughly 15 members who play actively. We are among the top PvE guilds but I can’t get them to care. We go up against guilds with 500 Republic characters, 500 Imperial characters AND reserve guilds. It’s impossible to compete. Michael: There are guilds with a lot more people who care more, and the harder objectives give little to no points. Example: There’s nothing for clearing nightmare. There’s nothing for hitting a threshold ranking in Ranked pvp. Dev: We’ve only just begun to dip our toes into what’s possible with that system. We’ve been very careful to set it up and give ourselves powerful tools so we can do some different types of conquests. Dev: That concern you brought up was in conversation for a while. We’re aware of it. Michael: My members that care at all for achievements, what they do is they put an alt IN the big guild, and then they hit the conquest, and then they hit the achievement. Swtorista: Once we hit 60, will we be able to hop right into the new operations? Or will we have to go back and re-gear. Dev: You will be able to hop right into them. The story modes of course. The storyline actually leads you into the Temple of Sacrifice operation. You can bypass it, you can do the solo option to get to the finale. The story modes are meant to be seen and done – they are meant to be seen. The hard modes are really, really hard. Michael: They actually are. [laughter] I’m not so enthused by that – I’m concerned, I think the average hard mode guy is going to be pretty frustrated. Swtorista: Someone at one of the cantinas was speaking to Gaddock Teeg of the Unnamed SWTOR Podcast and with a little bit of alcohol involved, happened to mention a costume system. Is that anything you can talk about? Dev: [intakes of breathe, partially mocking] Who did that!?! Heather: That was in New York. Dev: We are taking a look into that. Swtorista: And have you looked at the GW2 costume system? Because I feel they are one of the ones doing it very well. Dev: [enthusiastic, amused, good-humoured] Bruce literally went to the event in New York going “I’m just going to tell people everything. I’m going to tell them all kinds of stuff.” People have made the joke that Bruce was just drunk and revealing information [Andrew Horowitz interrupts and claims it was his fault Bruce got drunk] – but Bruce was literally quite frustrated that we were holding back and our communication was light and we were holding information back [due to the expansion]. Michael: If I may, I think that approach would be better. As a player, I’ve been frustrated with how opaque everything’s been. Dev: We created our own perfect storm where we really just worked in a vacuum. We’re totally a studio of “let’s be transparent”. My manager is like that, these guys are like that, we want to tell people everything. We just created this weird situation where we put ourselves in a vacuum of silence on accident. It just happened that way. And it was kind of a horrible situation we were in. Dev: [Bruce] It was such a great crowd. Ughh just such a great group! Swtorista: Quite a few other MMOs have actual online – online on the internet, not online ingame – resources. APIs that can be sent to fansites, armoury’s like WoW’s where you can look up your character, places where you can share and advertise your guild online, things you can look up what you can buy form the Cartel Market. What are you guys doing with this, anything? Dev: Yes. We are look at all of the things you just said. We are having a fresh look. We haven’t been doing anything for a long while, we haven’t pursued those things, literally within the last month, let’s have a re-assess. Heather: Is that what you were touching on when someone asked about the crew skills offline on at the Cantina? Dev: As we look at that stuff, that’s naturally one of the things we’d consider rolling into it. It’s one of the things we re-assess. Swtorista: A while back you guys said everything about 12X XP was a big experiment. Do people play more? Play less? Did it ruin the game because they don’t have any more characters to level? [laughter] Obviously we still have to wait a while and it will be a while till afterwards once they actually have all their characters, but what have you seen so far that has been interesting? Dev: First of all, it’s been AWESOME. We love it. Everybody that we’ve talked to loves it. It’s great fun. It’s like we have 8 KOTORs in our game – right? We found a way to kind of bring those up to the top. I think it’s gone perfect – it would have been great to toggle it off if you didn’t want to do that – we saw how much travel time was annoying where normally there would be other filler – gear which we’re gonna look into. Very good and we’re talking about several different possibilities. I think it’s safe to say we haven’t seen the last of it. Dev: It’s a net positive. MMOBomb: Would one of the possibilities be less filler, more cool stuff? Dev: Yes. Shadow of Revan was designed in a different way from ROTHC and especially pre-launch. The quest focuses on the core story. The filler, as you might say, is pushed off, we put our time into the cool stuff. Put in a lot of time to make sure everything is meaningful, not just there to make you spend time. Swtorista: Now that conquests has been out for a while, have you seen a noticeable decline in guilds participating? Or do you track those numbers? Dev: We ABSOLUTELY track those numbers. We are obsessive data trackers. Seriously. We have a report that comes back with those numbers and plenty more every week. Actually, the percentage of guilds that own a flagship and are participating in conquests has gone up. We weren’t sure what was going to happen – but at least in the numbers – it is sticking around. But as I said we haven’t started to experiment with conquests. We built it in a very robust way that we could do some [stuff]. Swtorista: So there’s been a lot of talk about data mining. You might not want to talk about it at all. 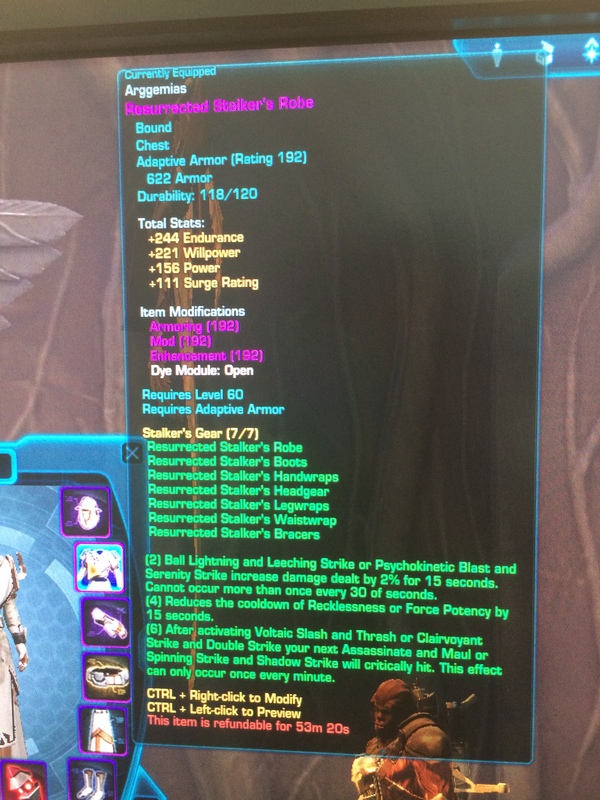 It’s brought some really positive things for example the conquest list on Dulfy’s site brought by swtor_miner that allowed guilds to talk about it before invasion day, there’s also been some really negative things where data mined items or perks have been found but weren’t actually released in the game. Even little things like seeing items on the PTS but not having them carry over makes people really upset. [hesitant] Do you feel that in any way data mining should be allowed in certain cases? Or not at all? Dev: Well we can’t stop it. Our policy is: they’re gonna data mine. We tell everyone – this is going out. It’s gonna get data mined. Just know that. Dev: The client’s in the player’s hands, and if the player wants to dig through the client, they can. Dev: Makes Eric’s life miserable. [laughter] But I think overall I don’t think it’s a problem. If people get upset about it, all we can say is “you weren’t promised anything” – we make a lot of stuff we don’t put out. Dev: [Eric] I can speak about the community – I think at least the last couple months data mining especially has been a thing. There was a really strange perspective in the community that we were waging a war against data mining, and I think that happened because we told TOROcast that I wouldn’t do an interview with them because they were talking about data mining and EXPLOITING. Dev: That was actually the thing. Dev: [Eric] What spun this all up is that they had a show where they were specifically talking about data mining – which I do need to say, although we know it’s going to happen it IS against our rules – but they were specifically talking about how to EXPLOIT content. And because of that, I just couldn’t draw attention to it. It spiraled into “we hate data mining”. You can look – we’ve never asked Reddit to take down data mining posts, even fan sites that post data mined content, we never ask anyone to take any of it down. It’s not that we’re against data mining – it’s just that we can’t be FOR it. Dev: [multiple people speaking] remember, to Eric’s point, it’s technically against our ToS so we can’t go “Yeayyyyyy!” [positive excitement] on the other hand there’s nothing we can do about it. If you look at Dulfy’s site, I think that’s incredibly useful. That’s the kind of information we talked about before by extracting this kinda stuff out of the game and putting it on the web. We’d love to do that, it’s a lot of work, to make it right and make it useful and meaningful. We don’t have it yet, we like Dulfy, we like her site. Dev: I also think what helped cause that problem is that we were in that silence vacuum. Normally we have this weird harmony with data miners – we talk about what’s coming, we make sure we get our announcements out, we’re well ahead of data miners; normally the stuff that’s in the game client is nothing new. Normal Bioware would be transparent, and would tell you what’s coming. This situation wasn’t that. So we didn’t have that thing where data mining happens, that’s fine, we normally are ahead of things. That created strain and friction that wasn’t helping. We’re not really sure how it happened, but it did. Dev: It’s also a weird thing because as developers we can’t send the message to the data miners and be like “look guys we’re totally fine”. It’s weird because we’re not against it, but we can’t be FOR it. And so us being like “data mining is great guys, go out there and do it” we can’t do that at all. Dev: [tripped up a bit] I’m being genuinely honest – it’s one of those things that’s a weird situation because it created a problem that genuinely there was no way for us to solve. Dev: This is not our first Exar Kun question! Michael: It is not actually. Michael: Honestly I wouldn’t have put the expansion there. Considering that he’s there. Dev: A ) that was partly, it was there because that was something we had wanted to be going towards for a long time. When I mention things from 2006, that was one of them. We wanted that part of the story to happen there for a variety of reasons. I don’t know if you’ve been on there recently, are if you were on the PTS? There’s a little bit of stuff touching on that. And it’s something I’d like to explore more, later. The trick is, all of that stuff, would take a whole other expansion to explain to people who don’t know about it. If you put Exar Kun into a major part of the story, – and you’re right, he deserves to have a major part – yeah, he ties into all that, and there’s other things that we’ve talked about, behind the scenes, things we haven’t really put out yet. Michael: Well you can’t kill him, because he is supposed to show up in 3,500 years. Dev: Right right, you can’t destroy him, there’s limitations to what you can do with him, there’s limitations on how much information we can convey in an expansion. An expansion is like a TV show, it’s 40 minutes, we have this amount of time. We have to decide, do we want to spend it on these characters, who are cool and we like, but a lot of people aren’t familiar with, and haven’t seen much of yet, or do we focus on Revan, the stuff we have been talking about, and find a way to wedge them in when we can. Michael: It’s very self-contained, but you are going to get a ton of questions about that. Swtorista: Do you guys make a conscious effort to balance Cartel Decorations and ones you earn in game? Dev: Absolutely. Constant struggle. It’s a negotiation between two parties. Yeah, we don’t wanna take all the cool stuff and throw it on the market. We want a balance. Swtorista: Oricon was received pretty well by the community; it was done differently with the daily areas leading into the operations. What are some things you learned from that planet and are taking forward into Shadow of Revan? Dev: Great question. Shadow of Revan definitely draws on all of our learnings – it draws almost as much on RotHC as Oricon – RoTHC there were some opportunities for improvement there. So we learned a lot. Like… dense, mission-packed, make it worth the player’s time, like Oricon is very worth your time. And what we took into Shadow of Revan is to make sure “Is this worth the player’s time?” Make sure that it’s rewarding. One of the things that happened with RotHC is that many players leveled without ever going there. We spend so much time building these cool worlds and these cool stories, so we made a big effort to draw on the last expansion to make it very worth player’s time. Dev: I think as well, doing a solo story leading to the operation, it had its pleasant ideas – we really wanted to get solo players more aware of how cool an operation can be, give them something that’s like “no, really!” Like you said, in the Dreadmaster story, there’s cool stuff happening here that maybe they weren’t familiar with or didn’t even realize existed. So you know. That’s what we’ve tried to do with SoR. Have the story lead into an operation. Downside to that was [in Oricon] you couldn’t see the very end of that story unless you played an operation and so I think learning from that was, we always need to try and make sure there’s a solo way to experience the coolness, the main parts of the story, the story of SoR. 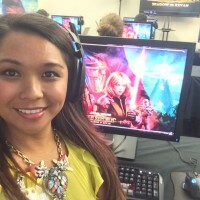 Swtorista: One of the cool questions my guildmates had is in GW2 and Wildstar we can have guild crests. Will we ever have these in TOR? Dev: Possibly. Can’t tell you never. It’s one of the features we’ve talked about, on and off, forever. We love TOR, as long as people keep playing we’d love to add stuff to it. So that’s entirely possible. I can think of some more challenges there, it would have to fit into Star Wars lore, those aren’t challenges we can overcome [easily]. Dev: Done! I love the gree so much dude. Again, I would HIGHLY recommend listening to the audio version for a complete version of this Q&A on Corellian Run Radio. I am so thankful that we were invited and that I was able to attend. I don’t think I will be invited to another, because I think they will want to give other fan sites a chance, but I would absolutely love the opportunity to do something like this again.